During all of our recent flying, let's just say I've watched A LOT of movies. And I do mean A LOT. 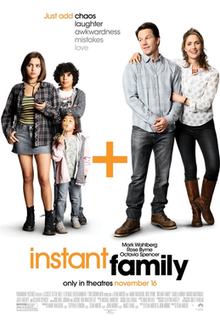 But one of the films that stood out the most to me was Instant Family starring Mark Wahlberg and Rose Byrne. What a delightful movie. It's heartwarming, incredibly funny, and tender. I bawled. I laughed. I wanted more. I rented it once we were home so Keith could watch it, as well, and then I bought it. That's how much I love it. Check it out! You'll love it.